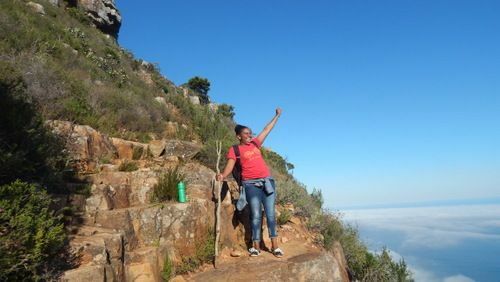 When my adventurous colleague proposed that we go hiking, I was reluctant at first given that I hardly exercise. 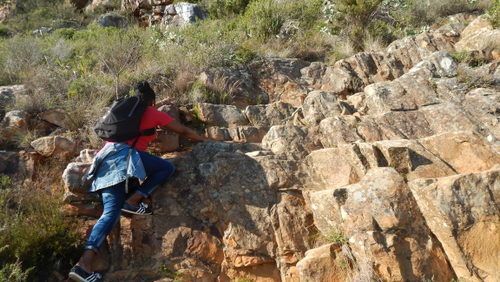 Eventually I agreed to hike up Kasteelspoort as its the easiest ascent up Table Mountain. 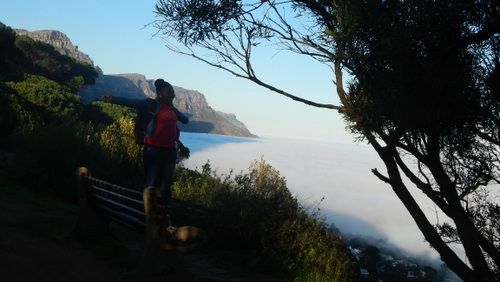 After all she is an experienced hiking tour guide and a holiday adventure in Cape Town is not complete without a trip to Table Mountain. .
We parked at the Lower Cableway Staion and started walking early in morning to take advantage of the cool shades from the old alien trees lining the Pipe Track. 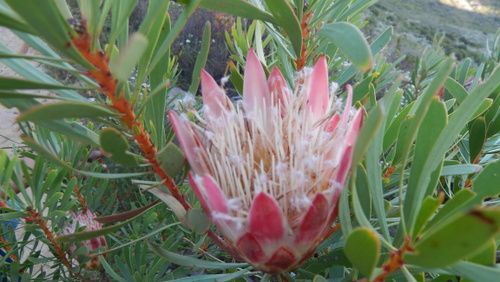 We spent a lot of time admiring the beautiful fresh scented wild flowers; with various kinds of the protea family from King to the black-bearded sugar bush protea, Ericas, sundews and so much more. I was hyped up at the beginning since it was fairly easy 3.5km along the pipe track before the actual ascending of the mountain. 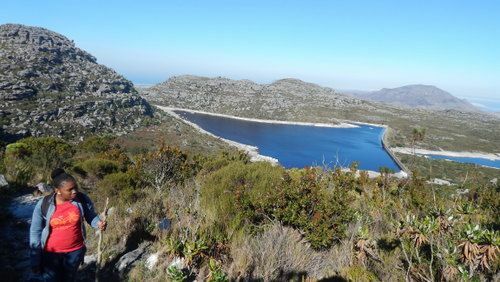 The trail is lined with pipes built in 1887 which used to carry water from the Disa River, on Table Mountain’s Back Table, through the mountain via the Woodhead tunnel, and eventually to the Molteno Reservoir in the city. After the warm up the real climb started up Kasteelspoort Gorge. When we reached ‘breakfast’ rock which marks the top gorge of the mountain, we sat and enjoyed breakfast while overlooking a gushing stream sending waterfalls to the bottom of the mountain and breathtaking marshmallow looking clouds hovering over the ground below. Once on the mountain we still had a long way to go, to get to cableway and the path undulates through valley of isolation; valley of red gods and echo valley before finally ascending a steep metal ladder getting up onto the flat topped Table Mountain. At some point I was too tired to walk any further, my legs couldn’t carry me any further. My t-shirt plastered with sweat on my back and my short legs weren’t making it easy either. I had to scramble and crawl up the rocks. I felt like giving up, but Meike cheered me on and gave me plenty of breaks. Five hours and eight kilometers later, we made it to the top. It was an amazing feeling, and I felt like a world conqueror. The route is certainly not the shortest as it takes 4-5 hours, but it’s not too strenuous either. The mind blowing view of the city stretching out as far as Camps bay and Sea point beach makes it all worth it. The route is a combination of stunning views; the lush green vegetation with various wild flowers makes a wonderful distraction for all the effort.